When thinking about the giants of the high tech and conglomerate industry, the usual suspects usually always turn out to be Apple, Facebook, Google, eBay, or Amazon. Those are the brands that everyone talks about - the general public, newspapers, media, magazines, the internet. Samsung still is a big brand, although its rise seems to be happening more covert than the cometlike climb of others. Samsung is worth taking a closer look at, though. In 2014, Samsung's revenue totalled at 305$ billion - Apple came out at 182$ billion that year. The trend continued in 2015. Profits are soaring, and that with only 14$ billion in average spent on advertising and marketing - Apple for example spent 38$ billion alone on the Apple Watch ads and its promotion. If that's not surprising enough, Samsung also adds up to 489.000 employees - which is more than Google, Apple and Microsoft combined. Samsung alone is responsible for over 17% of South Korea's entire GDP. Samsung entered into the electronic business in the late 1960s - originally, Samsung sold groceries and noodles after being founded by Lee Byung-Chul as a small trading company. He was the richest man in South Korea for a very long time. In the late 1950s, the insurance and securities as well as the retail business were added, bringing on further growth. In the 1970s finally, the first Samsung produced Electronics (namely TVs) hit the market, and a gold mine was struck. Soon after, the first Samsung computer was released 1982, and Samsung began to conquer the international key markets outside of South Korea. In 2011, it became the world's largest smartphone manufacturer and continues to be exactly that. The rise of Samsung did not happen by chance or coincidence - Samsung conquered 22.4% of the 2015 smartphone market share (Apple holds 16.4%, Huawei 7.7% e.g.) by investing heavily in research and development. Where Google spent 9.8$ billion and Apple 6$ billion, Samsung put 14.1$ billion into that area. Samsung has another advantage: The CPU chips for Apple's iPhones 4, 4s, 5 and 5s are solely manufactured by Samsung, and we are talking about over 600 million chips here! 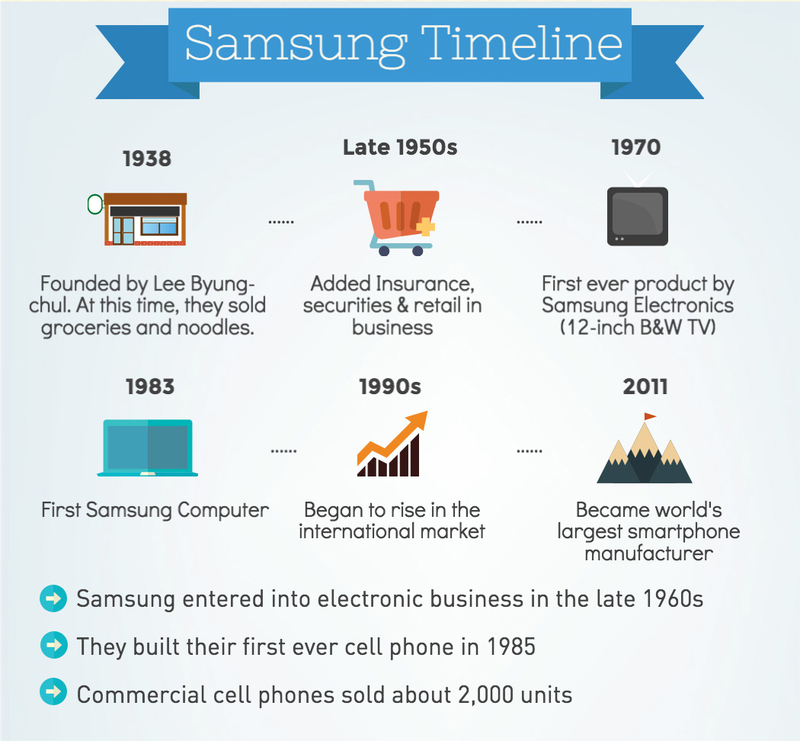 Since its foundation, Samsung always consisted of several different businesses in multiple industries, ranging from ship and crane building to plane manufacturing to other big engineering projects. The forecast for 2016 and the coming years therefore looks splendid: the chip market is vastly expanding and demand is high, plus potential downturns can be balanced out by Samsung's other business ventures such as Samsung Construction, who just won a bid for the downtown tunnel system in Singapore. Source: Infographics and data taken off http://www.tufitech.com/samsung/how-big-is-samsung-infographic/ by Anup Kayastha.